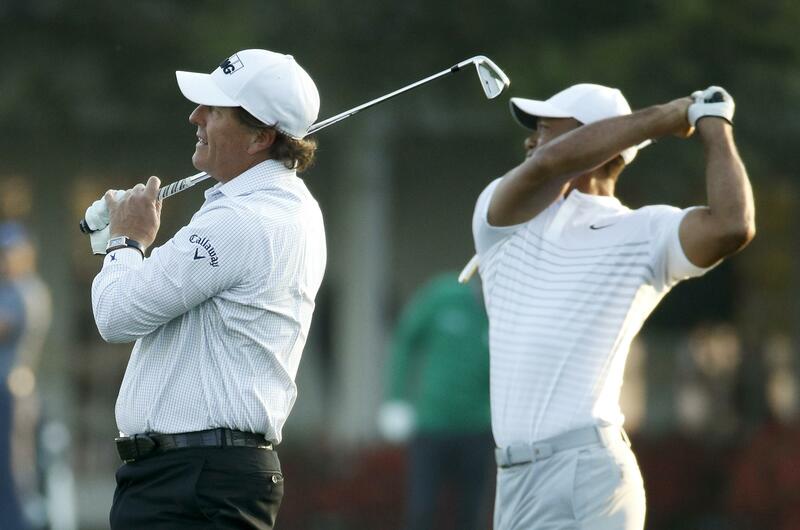 It’s Tiger vs. Phil – or Phil vs. Tiger, depending on your point of view – for a boatload of money, according to ESPN. The highly anticipated showdown between Tiger Woods and Phil Mickelson will take place either Nov. 23 (Friday) or Nov. 24 at Shadow Creek Golf Course in Las Vegas, ESPN’s Mike Greenberg reported. Rumors about the winner-take-all event have been swirling for a while, with a $10 million payout figure being tossed about. ESPN reported that the purse has not yet been determined, but these guys, you know, don’t work cheap. That would be a commanding 79-43 “edge” for Woods. “It’s going to be fun playing with him again. We have both done this throughout our careers. We have always looked at each other and said, ‘Where is he on the board?’” Woods said of the Players grouping in May. “That’s what Arnold Palmer and Jack Nicklaus used to do all the time. They’d always try and find, ‘OK, what’s – what’s Jack at?’ And the same thing with Jack, ‘Where’s Arnie at?’ It’s been either way for our entire careers. If this all sounds dimly familiar, there used to be a Skins Game on the PGA Tour from 1983-2008 and Woods participated three times, in 2001, ‘04 and ‘05. He was the runner-up each time. The first Skins game featured Gary Player beating Tom Watson; in the second, Jack Nicklaus beat Watson. Four golfers were invited to compete and played to win individual holes (skins) in a match play format. Each hole was assigned a monetary value and the golfer who won the hole with the best score won the money for the hole. If there was a tie, the money carried over to the next hole. A tie after the final hole brought a playoff that didn’t end until one golfer won a hole outright. Published: Aug. 2, 2018, 11:35 a.m. Updated: Aug. 2, 2018, 3:01 p.m.